Beasts of Olympus is a series of 144-page illustrated chapter books set in a magical Ancient Greece where strange things still walk the Earth. *Beast Keeper *tells the story of Pandemonius (a.k.a. 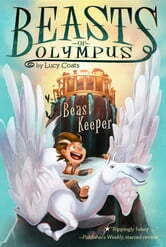 "Demon," the half-god son of Pan) who, on his tenth birthday, is called upon to look after all the mythical creatures that belong to the stables of Olympus.